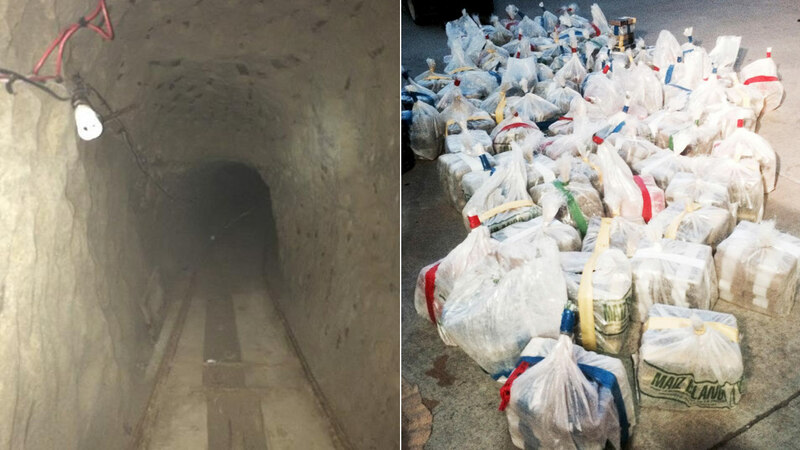 SAN DIEGO -- More than a ton of cocaine and seven tons of marijuana was seized and six people were arrested after federal authorities discovered a nearly half-mile long drug tunnel connecting Mexico and San Diego, the U.S. attorney's office said on Wednesday. The tunnel was estimated to be more than 800 yards in length - that's more than eight football fields. It connected a house in Tijuana to an outdoor fenced-in commercial lot in an Otay Mesa industrial park, about 500 yards north of the international border, officials said. The opening on the U.S. side is a 3-feet-wide hole that authorities said was once covered by a large industrial dumpster. The tunnel was equipped with rail and ventilation systems, lights and even a large, commercial elevator that led from the tunnel into a closet inside the Tijuana home. In total, authorities seized 2,242 pounds of cocaine and more than 14,000 pounds of marijuana. The six people arrested in San Diego on Friday were charged with crimes involving drugs and construction of the tunnel. The suspects were identified as Martiniano Garcia-Sedano, Cruz Armando Parra Corrales, Alejandro Bravo, Juan Carlos Chavez Fabian, Alejandro Gomez-Baez and Osmel Martinez. The U.S. attorney's office said the Otay Mesa tunnel is the 13th large-scale operational drug smuggling tunnel discovered along the California border since 2006. In the last five years, federal authorities have detected more than 75 cross-border smuggling tunnels, most of them in California and Arizona. The San Diego-Tijuana region is popular because its clay-like soil is relatively easy to dig with shovels and pneumatic tools, and both sides of the border have warehouses that provide cover for trucks and heavy equipment.